Read this step fully before continuing. Locate and remove the yoke on the front of the rear end. You need to remove the four 14 mm nuts (lock washers included). You will need to remove two nuts at a time unless you are really good. After removing two, rotate the drive shaft and remove the other two. We raised the rear of the car off the ground, rotated the wheels until the two nuts were on the bottom. Lowered the car and loosened nuts. Then raised the rear and rotated the wheels so the driveshaft made a 180 degree turn. Lowered the car and repeated. Using a drive on lift so this was an easy operation. 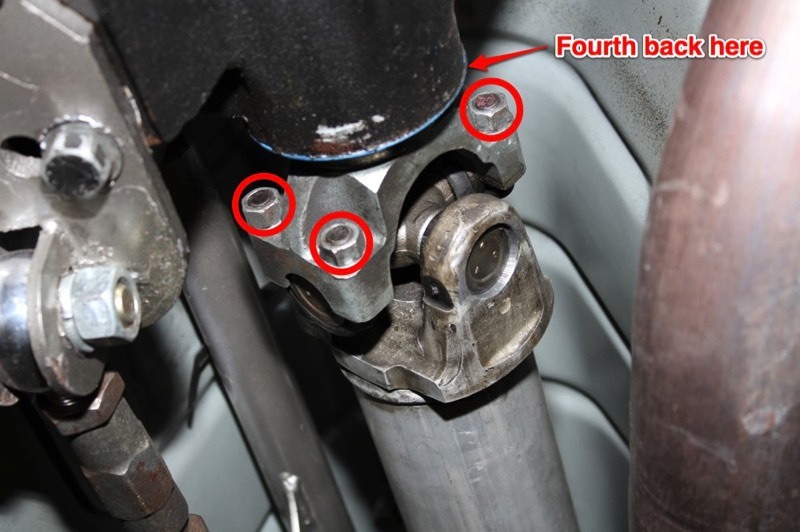 A car will likely be on jack stands, be careful, and place your car in gear to hold the driveshaft in place when loosening the nuts. Take out of gear and rotate the wheels. 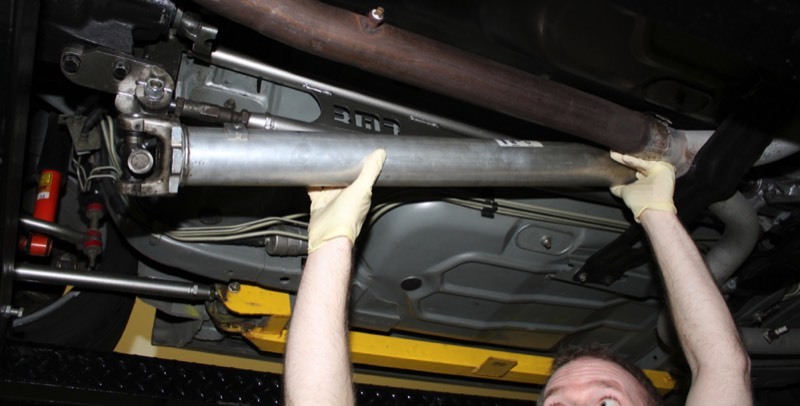 Take a hammer and lightly tap on the rear of the driveshaft. 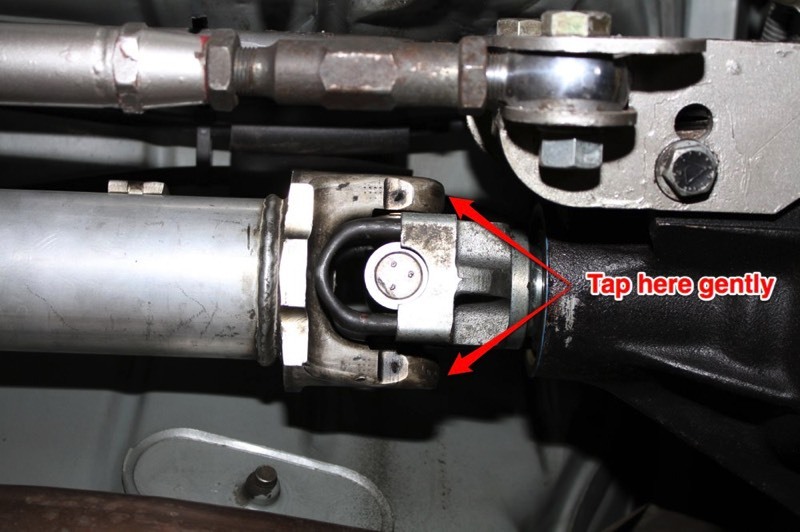 This will move the driveshaft toward the front of the car just enough to pull the two u-bolts out of the yoke. Be careful, the driveshaft is loose and may fall down with the u-joints and bust your head. Lower the rear of the shaft and pull toward the back of the car. 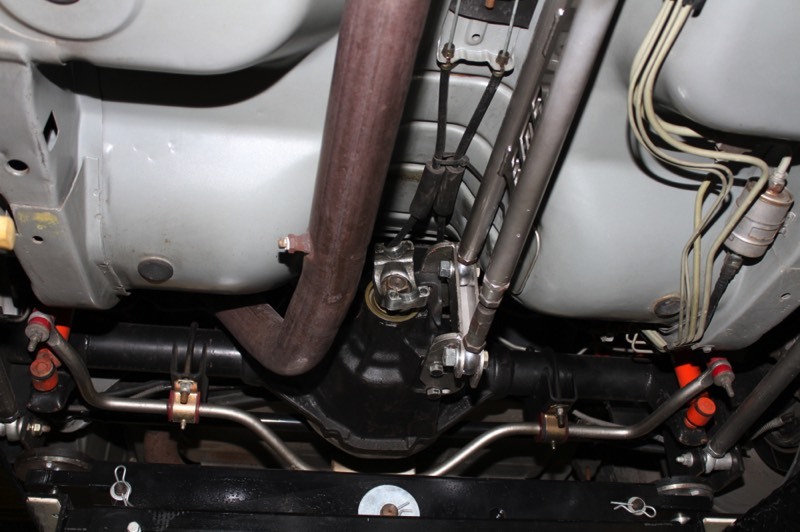 The driveshaft should slide out of the transmission easily. 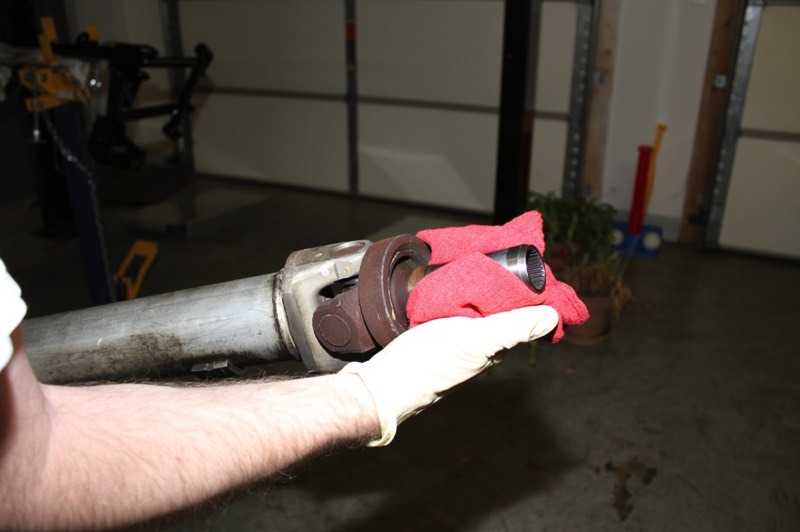 Using a rag, grab the end of the driveshaft that you just pulled out of the transmission. Wipe the excess fluid off the shaft. Lay the driveshaft to the side out of the way. 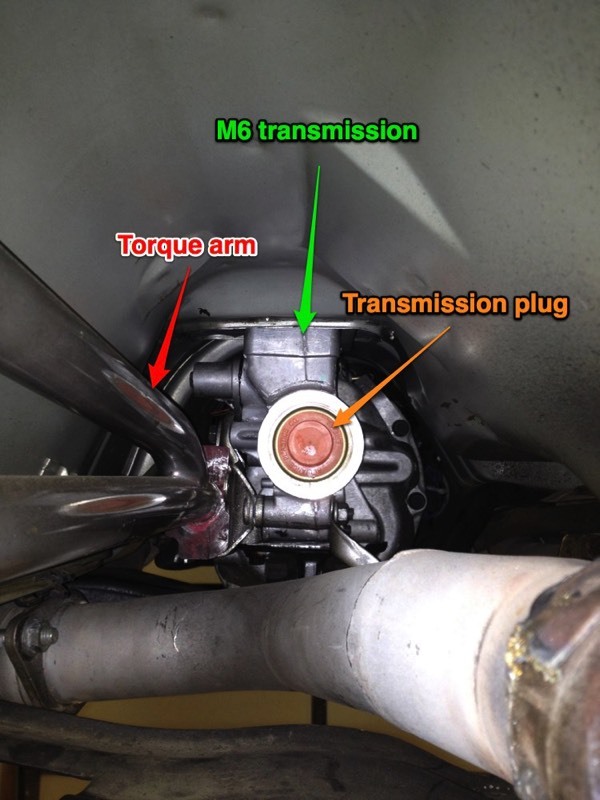 Insert the transmission plug into the far of the transmission to keep fluid from spilling out while removing the transmission. 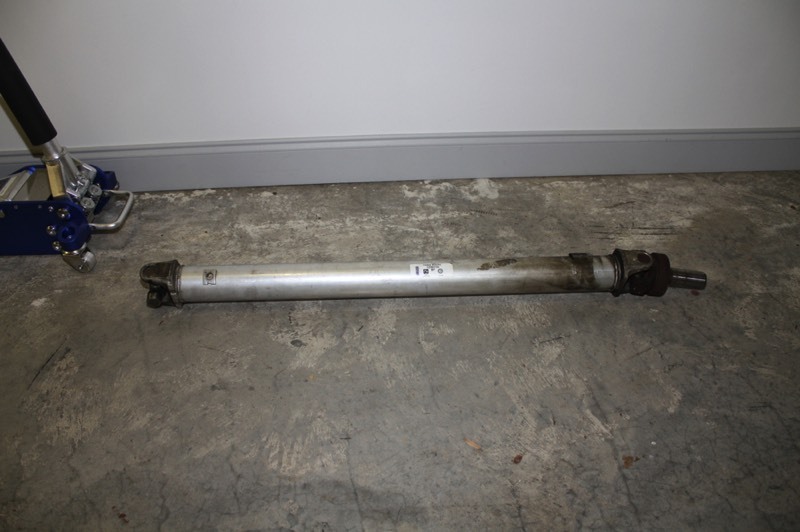 Here is a picture of the underside with the drive shaft out of the car.